CloakCoin, a proof-of-stake based privacy cryptocurrency, today announces a strategic partnership with Crypto Playhouse, a widely-followed social media influencer group with strong backgrounds in blockchain tech, trading and viral marketing. The partnership involves the creation and overarching distribution of a wide variety of content across traditional channels like Instagram, Facebook and YouTube, as well as more crypto-related, decentralized media outlets such as Steemit and Dtube. Chief Executive Officer of Crypto Playhouse Dan Alvarez adds, "To accelerate the global adoption of cryptocurrencies, it is important to meet the general public where they are the most comfortable: on social media, not Telegram! In collaboration with the Cloak team, we plan to leverage off our experience in social viral marketing in order to help a valuable project become even more successful." While this may seem like the start of a traditional relationship with an ordinary advertiser, it is far from that, given that Crypto Playhouse only works with crypto projects they investigate thoroughly and fully trust. Austin Doyle, Chief Technical Officer for Crypto Playhouse explains, "We are not traditional marketers and only work with projects that we believe in. In fact, we reject most paid proposals that come our way. CloakCoin is a solid project that's well established, has been around for years, and continues to move forward in their roadmap towards becoming a mainstream crypto payment option alongside Bitcoin and Ethereum. Their team is also very talented and like us, they believe in the importance of increasing the global adoption of cryptocurrency through the continuous distribution of educational and engaging content." Sidiropoulos acknowledges this mutually shared vision of mainstream acceptance when he says, "After our initial contact in February, we found that we shared many similarities with our partner, but above all the belief that crypto and blockchain could truly change the world." 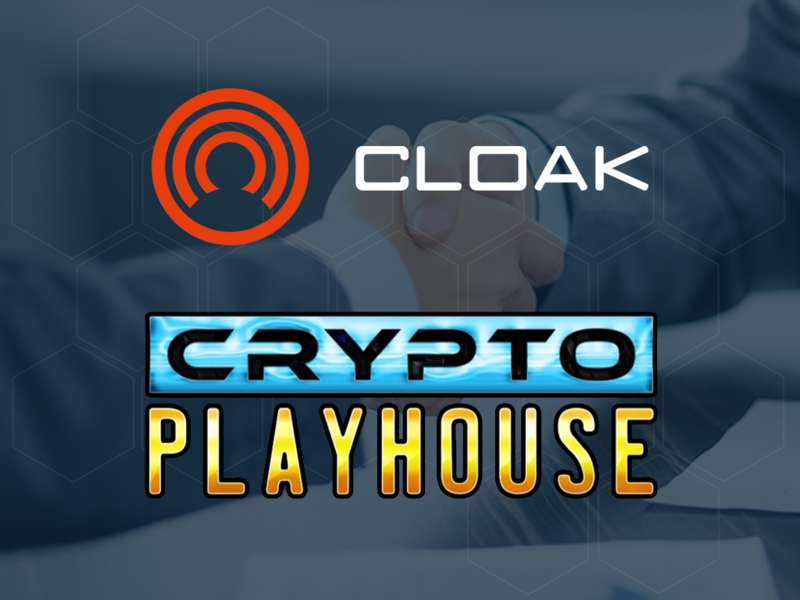 In addition to its involvement in content optimization and distribution, Crypto Playhouse will also act as an ambassador or spokesperson for CloakCoin at industry conferences and events. Stefan Kender (alias lasvegas83), CloakCoin's CEO concludes, "Besides their knowledge of crypto and marketing, Austin, Dan and the rest of the Miami Crypto Playhouse team are pretty awesome. I am really glad to work with such a highly skilled and dedicated group, and believe that this opportunity will open a lot of doors for Cloak in the US!" CloakCoin is a trustless anonymous cryptocurrency first created in mid-2014. Over several years and a few ups and downs, the entire code base of CloakCoin has been reworked by Cashmen and his team of developers to create a much improved version of its former-self. With the major code revamp, a staking ledger system, enhanced security and anonymity features, multi-platform wallets, and block explorer, CloakCoin addresses a number of the concerns related to Bitcoin and its stagnating development process. Crypto Playhouse focuses on forming Strategic Partnerships with promising crypto/blockchain related companies and projects by leveraging off its vast followers base and marketing experience on social media. The group works with strategic partners to disseminate highly engaging viral content that maximizes visibility for desired products and services. Unlike traditional marketers that are not experts in the space, Crypto Playhouse has a solid understanding of the cryptocurrency and high-tech industries, as well as over 25 years of trading and money management experience across many financial markets.